MiShel Designs: Echo Creative Club - April Reveal Is Here! 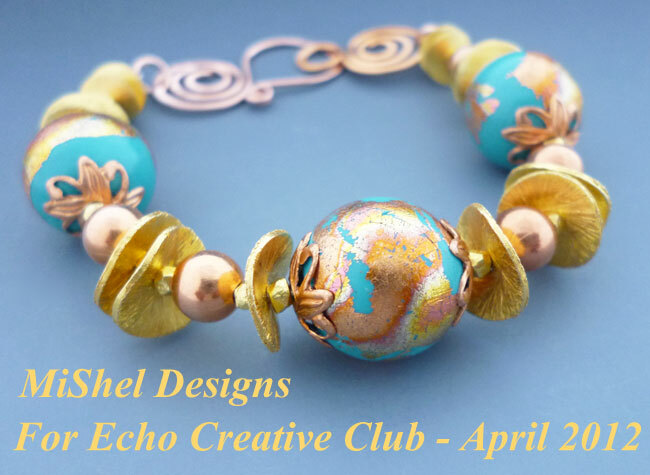 Echo Creative Club - April Reveal Is Here! Jeannie over at Jewelry by Jeannie. Jeannie makes some wonderful polymer clay beads and pendants - like the ones pictured here that I received from her a few weeks back for April's challenge. 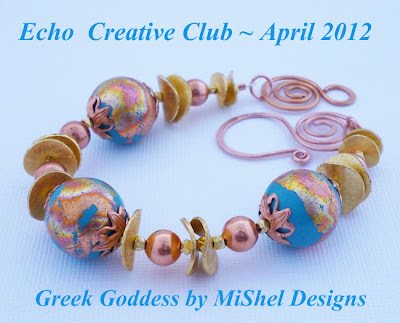 Each time I looked at Jeannie's pretty Peeled Paint Beads this month, I kept thinking to my self, "Greek Goddess". So, I think that's what I was channeling when this bracelet design came to fruition. I don't know,...what do you think? Not sure if it's really Greek Goddess like or not. I really like the colors though and the way it shines. 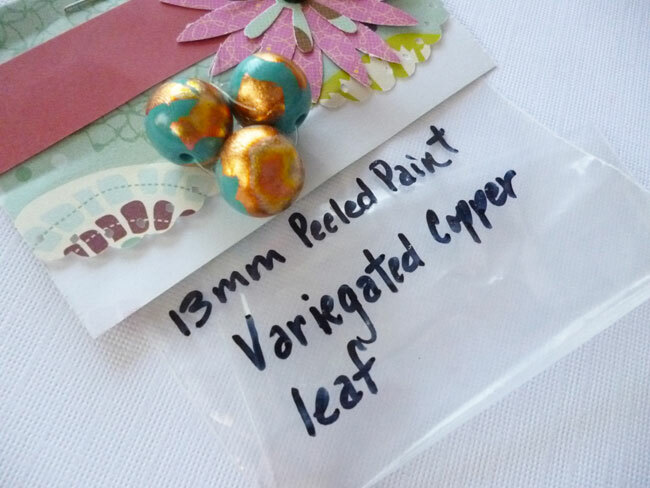 The Peeled Paint beads with their yummy turquoise color and the copper and gold tones made them fun to design with and I'm pleased with the way Jeannie's wonderful beads really stand out! I'm thinking I need to have a Toga party,...now that it's officially Summer in the desert,.....seriously. wearing for the next 6 months! Good thing I'll have my cool bracelet to wear, isn't it?!! Those of us on this month's design challenge team are listed below. Be sure to check out every one's fabulous creations. There's loads of talented designer's here who have created some yummy eye-candy for you to drool over!! of our designs over there, too!! Peace, Love and Sun Goddesses! I love the turquoise and copper together! I agree, a "cool" bracelet. Oh yes I can see the flowy toga and this bracelet sparkling. I am a bit jealous though because its only 40 here in New York! Oh what a gorgeous bracelet ...colors structures and those swirly hooks !! and the name ! I LOVE that blue! 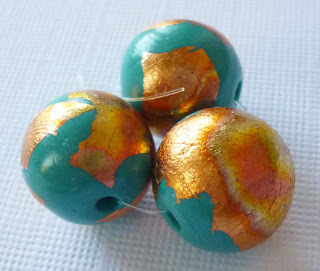 And the gold beads you used made it pop. BEAUTIFUL! 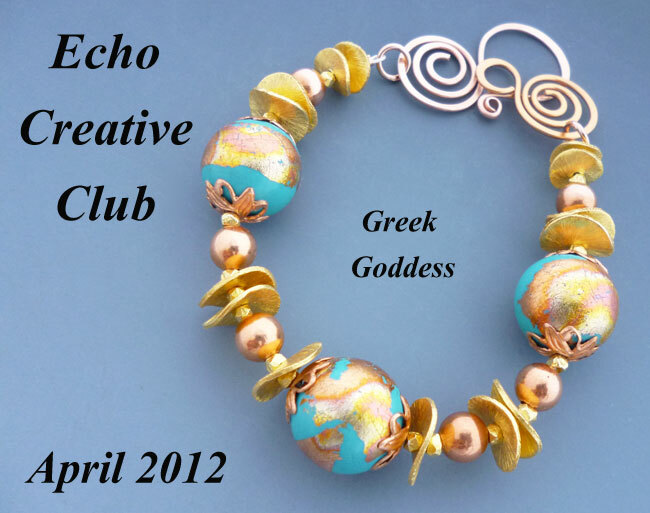 This bracelet is stunning Shel, so make sure the toga you're wearing is equally so! Love the clasp too! i can see this with a toga! lovely! Jeannie's beads are showcased wonderfully in this design! The colors are fantastic - I love it! 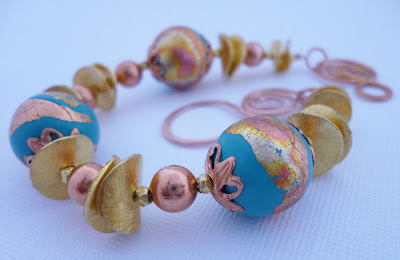 the turq and copper together look fantastic...i love the blend of the other metals too. gorgeous bracelet! I don't know what is a more beachy color than turquoise. I love these beads! I have them in some other colors. Jeannie does marvelous work and it is so fun to see how people translate them! Very pretty bracelet. 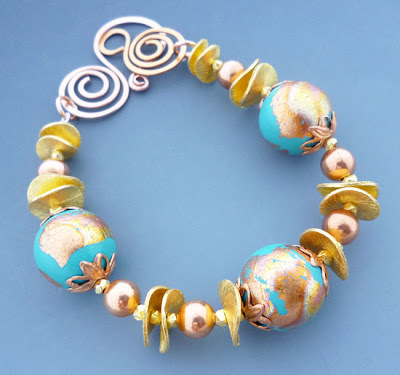 The wavy spacers are really great and I like the way you mixed the copper and gold tones. This is beautiful! I really love the copper with the gold. Those gold spacer/disc beads add just the right amount of elegance! Oh honey it can be anything you want it to be. It does make me think Greek. That clasp is to die for. My beads look very happy and I love the beads caps hugging my beads. beautiful! and the colors are great together.